Banks emerged quietly yet suddenly, impressing with her 2014 debut album, Goddess. It followed a series of EPs the year before, taking songs from those while adding some new ones in, too. Goddess wasn’t just one of the best debut albums of the year; it was one of the best albums of the year, period. And that is quite the act to follow up for such a young artist. Banks took on the challenge graciously, and her sophomore effort, The Altar, is no disappointment. On first listen, The Altar sounds smooth and consistent, a safe response to Goddess. But with more time, the listener starts to pick up on the distinctions that make The Altar remarkable. Banks primarily explores two different directions on her sophomore album. While she pushes the boundaries a bit further into dark chaos at times, she also takes a step into more vulnerable territory at others. The most shocking track is the first single, the taunting and partially whispered “F—k With Myself”. The title can be taken a few ways, though Banks has said that she sometimes is her own worst enemy and wrote the song about how she gets in her own way. But there’s also a self-love message in there. “Trainwreck” and the bonus track “27 Hours” offer up mayhem and drama, traits that work very well with Banks. Songs like “Gemini Feed,” “This Is Not About Us,” and “Judas” are intense, infectious, and seductive, demanding instant attention and multiple listens. Banks is at her most powerful and charming on these defiant, uptempo songs. On the other hand, Banks tries out gentle support on “Mother Earth,” an acoustic guitar driven song dedicated to her fans and assuring that there are people who understand and care about you. She also delves into sweet, vulnerable territory on “Lovesick.” Her ballads this time truly stand out, with “Mind Games” and album closer “To The Hilt” hitting home beautifully. “To The Hilt” in particular is a perfectly done ballad that plays your emotions. The Altar doesn’t grab you as immediately as Goddess; instead, it slowly takes hold and demands new attention. Giving it a few extra listens allows the songs to fully show themselves in their full glory. Sophomore albums can be hard, and Banks presented hers beautifully. Her writing and musicianship are strong and precise, and she avoids missteps better than on her debut. 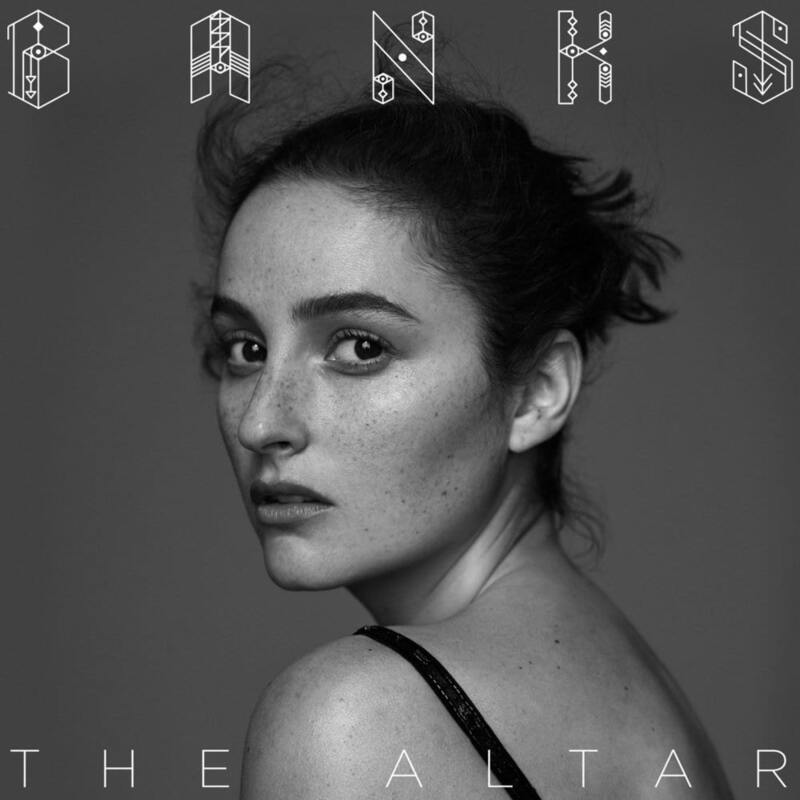 The Altar is a vulnerable, confident, exciting album that will be a memorable part of Banks’s discography throughout her career. “Gemini Feed” – The Altar opens with the instantly hypnotic “Gemini Fee.” This song was the second single released prior to the album. While the verses buzz with restrained energy, the choruses explode into a defiant attack on an ex-lover’s misguided intentions. Banks is fierce and passionate, and “Gemini Feed” stands out as memorable song that will stick with its listeners. Note: While the digital version of the track jumps right into the production and runs to only 3:06, the physical album version of “Gemini Feed” is 3:25 due to a stripped piano-and-vocal hint of the chorus. This is the same intro heard in the song’s music video. “F–k With Myself” – The second track on the album was also the first taste of the album that fans heard. It was the first single, complete with a disturbing music video. “F–k With Myself” starts with eerie, mysterious instrumentation, setting a dark stage for Banks’s drama. She sings theatrically, seductively whispering one minute, then warping her voice into a new character the next. While the verses are taunting, the choruses take on a more serious tone. Banks admits, “I used to care what you think about me,” but now she’s moved on. “Lovesick” – Banks moves into more delicate, intimate territory on “Lovesick.” She’s desperate for this person to “come love me,” but she “ain’t even ashamed” to admit this. Banks allows herself to sound vulnerable, but she’s not weak or timid. She deserves the love she requests. “Lovesick” is a soft, full song that balances out the frenzied energy of the first two tracks. “Mind Games” – A promo single in August, “Mind Games” was our last hint of The Altar before the album’s release. The song begins with a simple, haunting piano. The lyrics cut straight to the chase, describing the couple’s unhealthy relationship. Banks plays her part, because, as she points out, “I know you like mind games.” But the game is getting old, and she’s tired. The chorus allows her powerful, high vocals to shine as she wails, “Do you see me now?” It’s a lovely song, though a bit of a grower. Give it a few listens and it will emerge as a highlight on the album. “Trainwreck” – One of the best songs on The Altar is the chaotic, gripping “Trainwreck.” Banks deftly spits out lyrics on the quick-tongued verses. Even though she “saved you from your darker days,” you can’t take her care for granted; “it was just a phase.” On the impactful choruses, Banks declares that “I had to get away.” “Trainwreck” is another powerful, instant song that would make a great single. “This Is Not About Us” – Track #6 jumps right in, layers of Banks’s a cappella vocals pointing out that “you’re taking it personally.” The slick percussion comes in, forcing your head to bop as Banks lays out the problems. The pre-chorus starts to take it up a notch, finally culminating in the perfect pop chorus as she sings “Mmm this is not about us,” complemented by “yeah yeah” murmurs and high chirps. Though the chorus can get repetitive by the end, “This Is Not About Us” is fun and could have single potential. “Mother Earth” – As “Weaker Girl” bleeds into “Mother Earth,” soft vocals and acoustic guitar take over. Banks sings in an ernest, open way, letting her voice strain on the chorus. She promises to be there in your time of need, imploring that “every time you fall, follow me.” Banks presents a supportive, motherly side of her that we don’t usually see. “Mother Earth” is gentle, simple, and more singer-songwriter than most of her songs. Violin and cello lead the song to a serene end. “Judas” – The tranquility of “Mother Earth” comes to a harsh close as “Judas” changes the mood. This song is suspenseful and intense, painting a haunted mansion in the listener’s head as Banks describes closets full of bones. She growls, “I can hear resentment in your tone, said I’d never make it on my own… too dumb to deal, too numb to feel the knife in back.” The chorus hits as Banks breathes out “Judas,” wavering just enough to sound like a ghostly breeze. It’s an exciting song and a highlight on the album. It also starts a trio of horror-themed songs that stands out on The Altar. “Poltergeist” – The third and final part of this trio is “Poltergeist”. If you’ve seen the famous 1980s horror film (or the recent remake), you’ll know that “Poltergeist” is German for “noisy ghost.” While Banks speaks no German here, she does start each verse with zombie-like vocals saying “Oh my god, I think I saw a ghost.” It’s spooky yet subdued. “To The Hilt” – The last song on the regular edition of The Altar is the excellent piano ballad, “To The Hilt”. It’s a lovely song and a perfect way to end the album. While the verses describe her pure relationship – “Before we had seen anything, we believed in everything… we backed each other to the hilt” – it’s the choruses that bring the most impact and tears. “Hated you for leaving me, you were my muse for so long, now I’m drained creatively”. They built a lot together, and he always saw her as a superstar and helped bring her confidence and success. But that success drove them apart. “To The Hilt” is a gorgeous song, and Banks’s best ballad to date. “27 Hours” – This final song is a bonus track on digital versions of The Altar. But although it was relegated to bonus track status, every fan should hear this song. It’s one of the best out of all 13 tracks, and should have been included on the standard edition. “27 Hours” starts with gentle piano, tricking listeners into thinking it’s another ballad. But wait for the shock of the explosive chorus as Banks’s shouts out “Baby, murder was a case!” or “It’s been 27 hours since we even saw the sun!” Horns and cinematic production make this song a dark, intense track. It plays like a raging storm or another horror film song. It’s one of Banks’s best songs and a standout on The Altar – even as a bonus track. You can buy The Altar on iTunes now.